COLUMBUS, GA (WTVM) – Sunday was Arrival Day at Midtown Medical Center in Columbus. The hospital opened its doors Sunday afternoon to expectant parents. 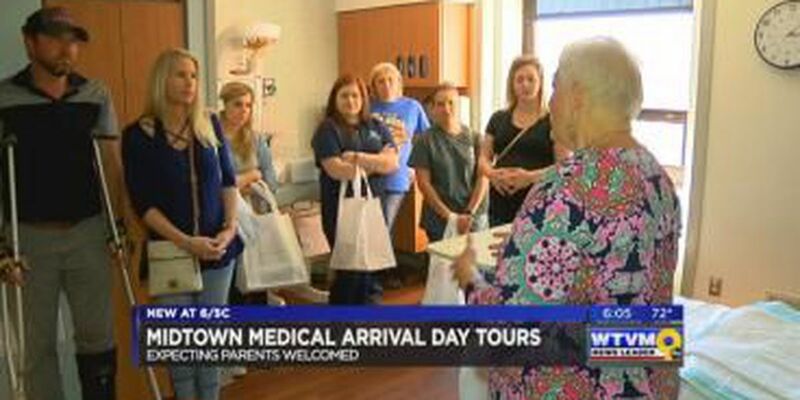 This was a unique opportunity for soon-to-be parents to see what Midtown Medical Center has to offer. Meet Emily Thomas of Smiths Station. She's expecting her first baby in August. "I'm nervous and kinda scare but I can't wait for her to be here," said Emily Thomas, expecting her first baby. So she decided to come to Arrival Day at Midtown Medical Center to see what it would be like once she goes into labor. She's part of a group taking a tour of the labor and delivery wing. The hospital has 12 newly renovated birthing suites with state-of-the-art equipment, plus the area's only Neonatal Intensive Care Unit. Dawn Hurst, the Director of Women's and Children says the facility is crucial to the community. "We take from 21 counties very sick mom's and babies. We're a staple in the community. We love our community and we love our family and we wanted to showcase what we have to offer," Hurst said. "I'm a little more excited but I'm a little nervous and I like the way the place is." The hospital delivers about 3,000 babies a year. Besides the tours, there were also a dozen or more tables set up from different vendors and agencies with information and giveaways. This was the first event like this for Columbus Regional Health and there was a big turnout with lots of families coming to take a look. The hospital plans to do it again. Midtown Medical says its new NICU will be done this fall along with the high-risk pregnancy unit. Cheryl Renee has become a trusted face and source for news across the Chattahoochee Valley. After four years of anchoring News Leader 9 at Noon and News Leader 9 at 5:30 p.m., Cheryl is back to anchoring News Leader 9 Mornings. She still anchors News Leader 9 at Noon each weekday.